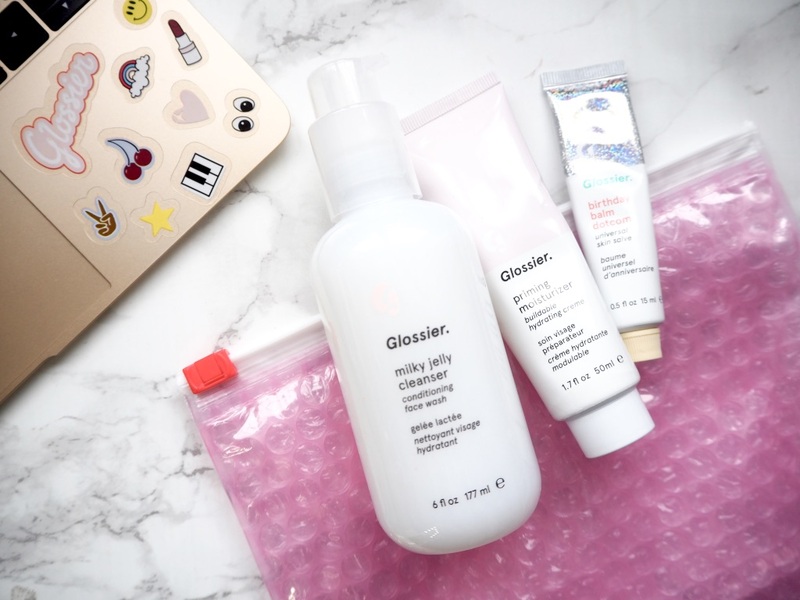 Glossier is a brand that has been on my radar for a while now but until last October you had to order from the US and customs fees drive me made so I hesitated about ordering. They finally launched their UK website end of last year and I kept filling my basket but not ordered. I finally took this plunge this year to place an order and started small so I could trial the ordering process and the products themselves. I went for the Phase 1 Set as it contained the most talked about Milky Jelly Cleanser, Balm Dot Com and Priming Moisturiser, all of which I had heard good things about. The set retails for £35 which offers an £8 saving on buying them separately I also got 20% off buying using someones discount code, so it was only £28 and free shipping. I think I ordered on the Tuesday and I had received it by the Friday so I was also impressed with the shipping. The products came packaging nicely in a cardboard outer and a white box inside that you could keep for storage if you really wanted. In it I got two of the handy bubble wrap style toiletry bags, one with the products in and another with the signature Glossier stickers and some little cards. I find small touches like this nice and it adds some luxury to the products, which leads me to them. I was excited to try this as its one of the first products i'd heard people rave about. However, one issue I have had is that I cant seem to get my pump to work, I have tried twisting it all ways and pumping for ages but it just does not want to release the product so i'm just opening the bottle and using it that way. The gel like consistency is nice on the skin and leaves it feeling soft and hydrated. It's not intense enough to remove makeup for me so I use it in the morning to clear my skin and leave it feeling refreshed for the day. I am a sucker for moisturisers as I suffer with dry skin and so i'm always looking for the best one. This is a mix between a moisturiser and primer so it creates the perfect base for makeup but also keeping the skin soft and moisturised. The formula helps the skin glow from within and smoothes out the complexion for the perfect base for foundation. The formula of the cream is nice and light so it doesn't feel heavy on the skin. This has been a wow products for me and i'm obsessed with it. I suffer with dry lips and I didn't think much would replace my trusty Nuxe lip balm but this may well do. I got the birthday cake flavour which is a sweet and sugary taste with a shimmer in the balm so it looks pretty on the lips. The formula is rich and smooth to apply to the lips coating them nicely and staying in place all day but it's light enough for day to day use. I'm already eyeing up the Cherry, Coconut and Rose versions as they are so lovely.